The Baker Hughes U.S. rig count was down 56 rigs this week to 1,069. Oil rigs were down 41 to 825, gas rigs were down 15 to 242 and miscellaneous rigs were unchanged at two. While everyone is looking at oil rigs, keep in mind that 242 rigs ties 1992 as the lowest natural gas rig count in the BHI records, which (publicly, at least) date back to 1987. By type, horizontal rigs are down 20 to 829, vertical rigs are down 18 to 148 and directional rigs are down 18 to 92. The drop in overall rig count is disproportionately affecting directional and horizontal rigs, which are down 53.5% and 58.2%, respectively, over the past three months (since 12/5/14). Horizontal rigs are only down 39.4% over that same period. The rigs still out there working are generally seeking "high value targets" and are not doing much exploration. 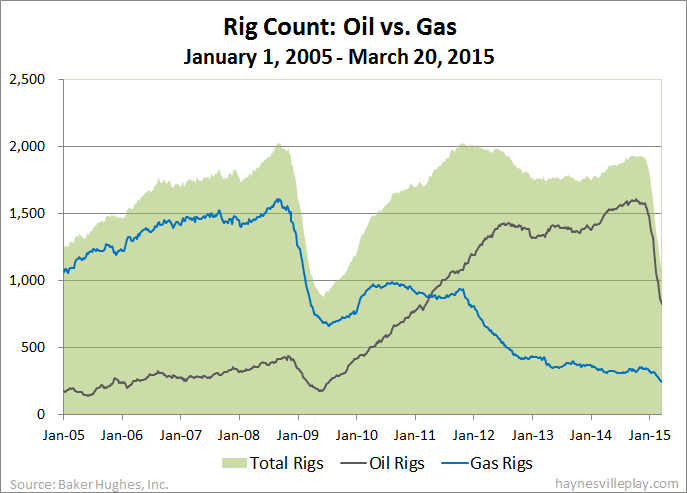 This is why we will not see a decline in production anywhere close to proportional to the drop in rig count. Among gas rigs, horizontal rigs are up one to 191, directional rigs are down six to 38 and vertical rigs are down ten to 13. Since December 5, gas-targeted horizontal rigs are down 24.5%, directional rigs are down 35.6% and vertical rigs are down 55.2%. Same conclusion as above.